To wrap up the 2010 season of Schlitz Gusto Guy softball, we dedicated a night to Carl Pavano. Some Schlitz Gusto Guy players even went with the unnatural looking mustache. It certainly was a nice night to put an end to the 2010 season (not coincidentally on the eve of 2011 pre-season workouts). The temperature for Game #1 was around 62 degrees. The temperature when we departed about 11:20pm was around 46 degrees. The Schlitz Gusto Guys tied with Moose Knucklers for 1st Place in the summer league. The autumn version of Moose Knucklers has been slightly modified. They do not quite have the horse power they had in the summer. We started off the game batting through the entire lineup en route to nine first inning runs. We kept our foot on the gas pedal as we scraped together a few runs in each of the following innings. We also locked them down on defense on a night where the ball appeared to be carrying. Pub Krull launched a deep 3-run homerun and T-Mac hit a lazy flyball that carried over the fence as well. Matty hit a deep homerun that counted for an out since he was late to the homerun party. Nice plays / catches in the field were made by CW, Matty and 2’s. The Schlitz Gusto Guys sticks continued to roll on this final night of Fall Ball. We gave up four runs in the top of the first, but answered with a nine-spot in the bottom of the 1st. The game was back and forth with neither team holding on to more than a four run lead after the 2nd inning. Again the ball was carrying. The outfielders reacted to the hits well and chased down many line drives in the gaps. Brain turned a nice double play on a hard hit ball to third by stepping on the sack and tossing to first. Pub Krull hit a ball about 350 feet landing in the infield of SFRCP “B” for a three-run homerun. Sans would later describe this homerun as only Sans could, stating, “That might have been the longest dong I have seen this year.” I guess what Sans means is, that homerun by Pub Krull was the “Greg Oden” of the 2010 Schlitz Gusto Guys. 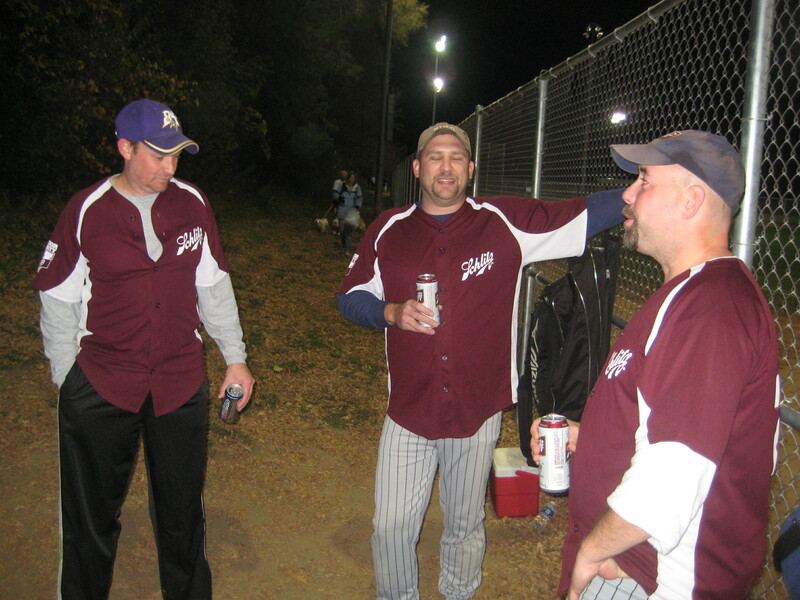 Another great quote from the final game of 2010 came from the 3rd baseman for Beer Me. He had bobbled a couple of slow ground balls before making a very nice play on a ball smoked his way. One of the Schlitz Gusto Guys told him “nice play.” He responded by saying, “It’s easier when it’s hard.” Truer words have not been spoken, 3-bag….Truer words have not be spoken. It was tied heading into the top of the last inning. Beer me pushed three runs and the Schlitz Gusto Guys were set to answer with the top of their order. Unfortunately, we had a couple of outs before Matty smoked a “no-doubter” homerun to left-center. 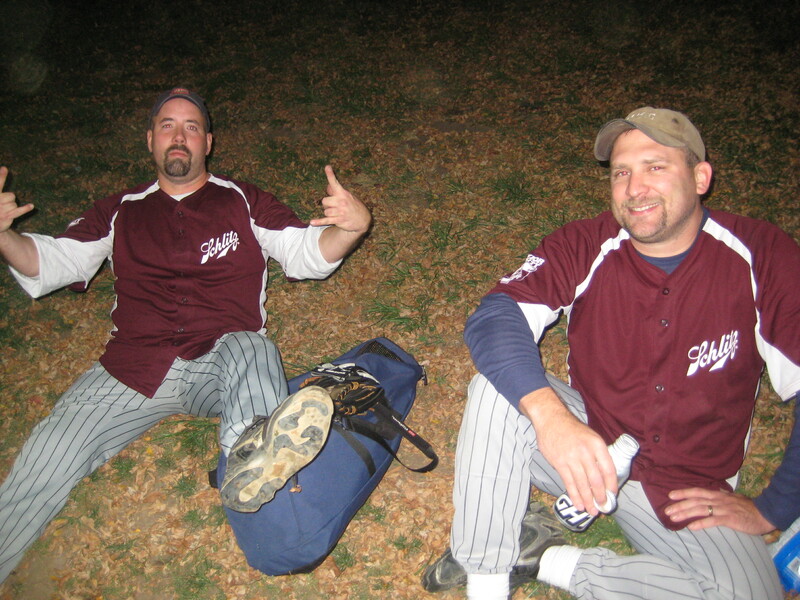 After T-Mac narrowly escaped the last out of the season by having the pitcher overrun a foul ball, CW hit a line shot knee high at the pitcher, who made a nice catch to retire the Schlitz Gusto Guys for 2010. There were some good Schlitz Gusto Guy laughs after the games as we remained at the fields until well after the final out. We could still field a team at 11:20pm.